MADE OF WALKING is a collaborative-participative event about walking practices, within the 11th ANIMART – Experiential Art School, Forum and Festival of Contemporary Creativity in Delphi, Greece. Made of Walking I in Summer 2016 brought together 23 walking practitioners and 100 participants from around the world. 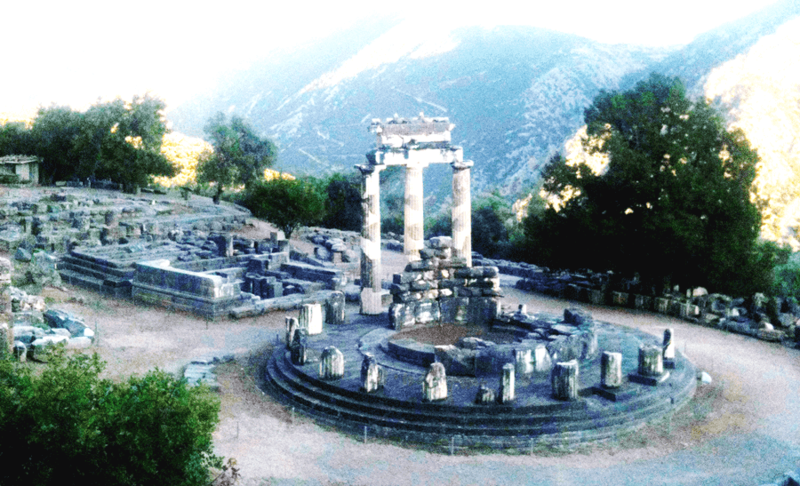 The second edition will take place from 10 to 23 of July 2017 in the town of Delphi and its surrounding villages, the archeological sites and the splendid ancient Delphi landscape. Main featured artist is sound artist and composer Ros Bandt (Australia), engaging with the participants of Made of Walking in a collaboration of making a giant illuminated people spider aeolian harp which can be played and moved around by walkers at night, connected with strings. A new sound composition will be played with attached portable speaker sound elements by composer Jon Drummond (Australia). The keynote workshop involves the creation of a "human harp", eight walkers connected with each other and Ros Bandt, playing the strings that connect them in their walking trajectory, resonating with the ground and the landscape. The performance will afterwards travel through Europe, from South to North. As a group the participants will perform from a graphic walking score, accompanied by stellar electronic sounds. All walking practitioners, performative and movement artists, (digital and non digital) artists, musicians and sound artists are invited to apply, as long their work relates with movement outdoors or spatial music/sound practices. Application can be both as attendee or as contributor with a proposed walk/performance, locative or outdoor installation, workshop, presentation, as well with relevant videos for screening. Evolving the act of walking in sound waves and webs is our conceptual and artistic proposal of Made of Walking in Delphi, focusing on ways of unfolding steps that restore a sound score of the dialogue between humans and the ground. In a broader sense, this rhythmical duet intends an ecologic ‘sculpture’ of the earth through various walking webs. In order to create an orphic mapping of these “erratic” places and spaces, agents of walk-thinking and walking-arts are invited to create new fields of promenadology, centered around World Listening - 18th of July with topic "Listening to the ground". We look for playful and dynamic interventions, leading to new conversations about and revealing the other sides of movement in lived space / landscape in an interplay between movement, performance, digital arts and new media. Ros Bandt (Australia), Jon Drummond (Australia), Stefaan van Biesen (Belgium), Isabelle Clermont (Canada). Pre-event / residency in preparation of a work or performance during Made of Walking is foreseen from 10 July - 15 July 2017. No funding is available for the selected contributors or participants, although we will provide in letters of invitation and in advice for available alternative funding opportunities. For registered participants to 11th ANIMART – experiential art school, forum and festival we can nevertheless facilitate in ***hotel accommodation and full board (breakfast, lunch, dinner) for 25 euros per person per day in double room, or 35 euros per person per day in single room. For attendees, deadline is July 1st.